Rhine River boat s401eure-ridr, length 68 m, width 11,20 m, with departure in Linz and Andernach on the Rhine River. round cruise boat ticket(s) for adults and children from 15 years offer no. RIF0806eure-ridr together with welcome drink (a glass of sparkling wine), buffet and drinks (beer, wine and non-alcoholic drinks) per person 157 EUR. There is a 19% added value tax included in the boat ticket price. Price change because of tax increase, diesel price increase, increase of the firework fee etc. possible until 4 months prior to the boat cruise date. If there is a price increase you have the right to cancel the boat tickets free of charge. Embarkation in Linz on the Rhine river (right Rhine river bank) from 2:45 p.m., departure 3:00 p.m. Boat trip along Bad Breisig, Bad Hönningen, Andernach, Neuwied, Engers, Bendorf, Vallendar, Koblenz with Deutsches Eck (German corner) and fortress Ehrenbreitstein, Lahnstein with Lahneck castle, Stolzenfels castle, Rhens with Konigsstuhl, Braubach with Marksburg castle, Brey, Spay, Osterspai with Liebeneck castle and Boppard with Kurtrierisch castle. The passenger boat gathers together with the other passenger boats to the boat parade in the Boppard Hamm and drives together with these along the lights und fireworks Rhine in Flames / Rhine Aflame near Spay (left), Braubach below the castle Marksburg (right), Rhens (left), Lahnstein (right) to the big firework display near Koblenz / Coblence from the fortress Ehrenbreitstein. Seating place below deck on a passenger boat, music with DJ and dance on board from 6:00 p.m. The firework displays can be seen from the open air deck or upper deck. Return in Linz on the Rhine river about 1:15 a.m.
Embarkation in Andernach on the Rhine river (left Rhine river bank) from 4:30 p.m., departure 4:45 p.m. Boat trip along Neuwied, Engers, Bendorf, Vallendar, Koblenz with Deutsches Eck (German corner) and fortress Ehrenbreitstein, Lahnstein with Lahneck castle, Stolzenfels castle, Rhens with Konigsstuhl, Braubach with Marksburg castle, Brey, Spay, Osterspai with Liebeneck castle and Boppard with Kurtrierisch castle. The passenger boat gathers together with the other passenger boats to the boat parade in the Boppard Hamm and drives together with these along the lights und fireworks Rhine in Flames / Rhine Aflame near Spay (left), Braubach below the castle Marksburg (right), Rhens (left), Lahnstein (right) to the big firework display near Koblenz / Coblence from the fortress Ehrenbreitstein. Seating place below deck on a passenger boat, music with DJ and dance on board from 6:00 p.m. The firework displays can be seen from the open air deck or upper deck. 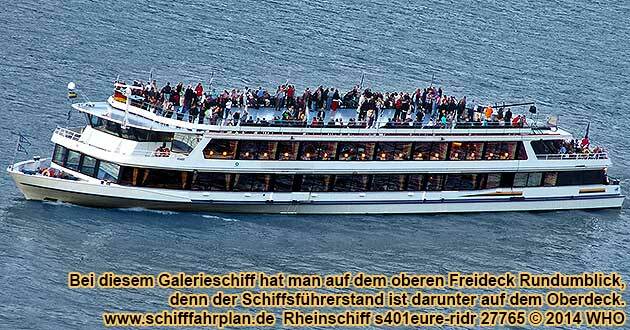 Return in Andernach on the Rhine river about 12:30 a.m.
boat tickets for children from 10 to 14 years with own seating place all inclusive offer no. RIF0806eure-ridr together with welcome drink (a glass of orange juice), buffet and drinks per child 157 EUR. boat tickets for children until 9 years with own seating place all inclusive offer no. RIF0806eure-ridr together with welcome drink (a glass of orange juice), buffet and drinks per child 157 EUR.